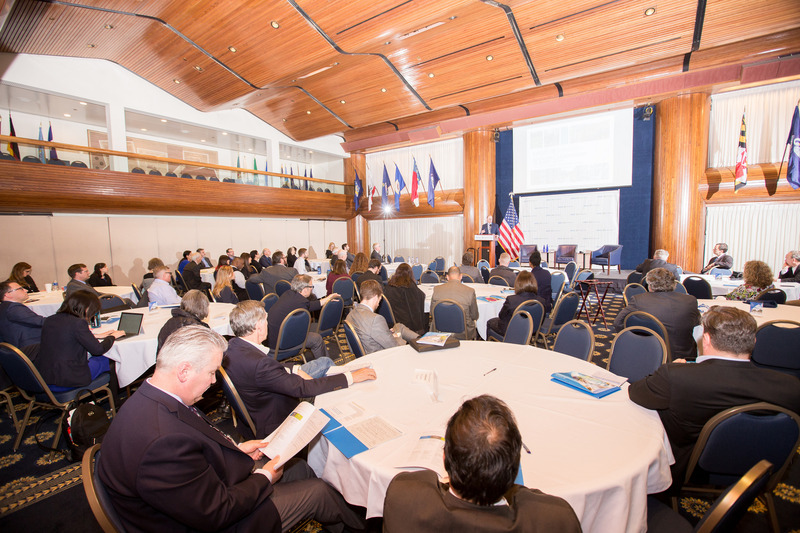 The 2017 LOCUS Leadership Summit took place earlier this week at the historic National Press Club in Washington, DC, bringing together responsible real estate developers, investors, transportation professionals, and local leaders from across the country to talk about obstacles and opportunities in building walkable neighborhoods served by transit. 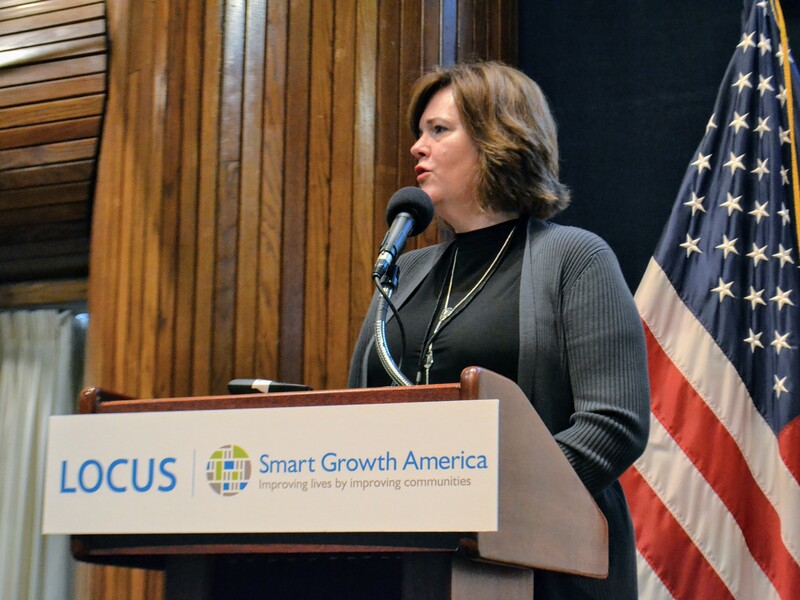 The Summit was also a chance for members of Smart Growth America’s LOCUS coalition, Local Leaders Council, and TOD Peer Network to meet one another and collaborate. 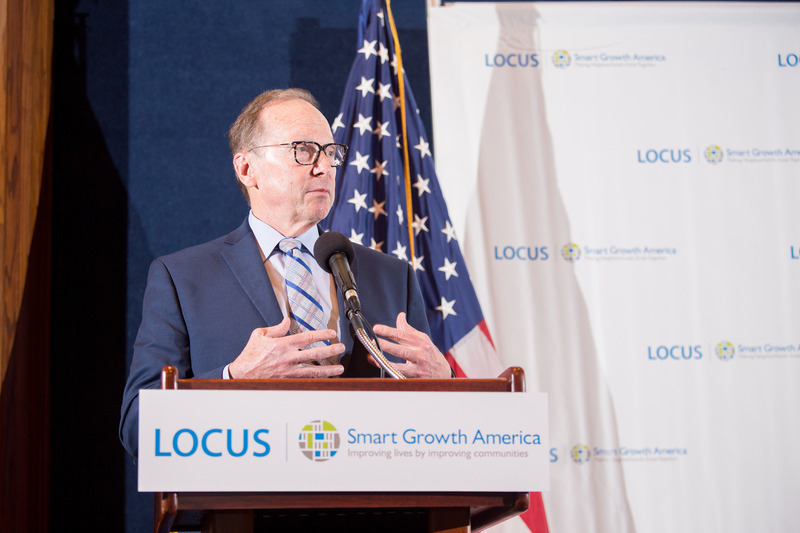 Jair Lynch, President of LOCUS and President and CEO of Jair Lynch Real Estate Partners, kicked off the event on Monday and welcomed this year’s impressive roster of Summit attendees. Mayor Madeline Rogero of Knoxville, TN and Chair of Smart Growth America’s Local Leaders Council provided opening remarks from a city official’s perspective. She explained how a smart growth approach has helped Knoxville flourish, and why it’s more important now than ever to use these strategies. The Summit program then dove right into the year’s theme—”P3 is for Partnerships, Placemaking, and Policy.” The opening plenary explored how smart growth strategies have helped build some of the hottest developments around the country. Dennis Allen, Paul Morris, and Robert Tuccillo spoke about development along Portland’s streetcar, the Atlanta BeltLine, and Denver’s Union Station. That afternoon, breakout sessions provided an opportunity for in-depth and candid discussions tailored to each network of professionals. The LOCUS real estate professionals roundtable discussed upcoming federal legislation, policy, and organizational initiatives to help with the development of walkable communities. Members of the Local Leaders Council, a national, nonpartisan network of elected and high-level appointed decision-makers in local government who are passionate about using smart growth to build great communities, learned and asked questions about federal policies that may impact their communities. And members of the National Public Transportation/Transit-Oriented Development Technical Assistance Initiative, a project of the Federal Transit Administration administered by Smart Growth America, had a chance to talk with project staff from Smart Growth America and the Federal Transit Administration to provide feedback about what they have gained from the project thus far, what they still need, and how the project could better assist them. 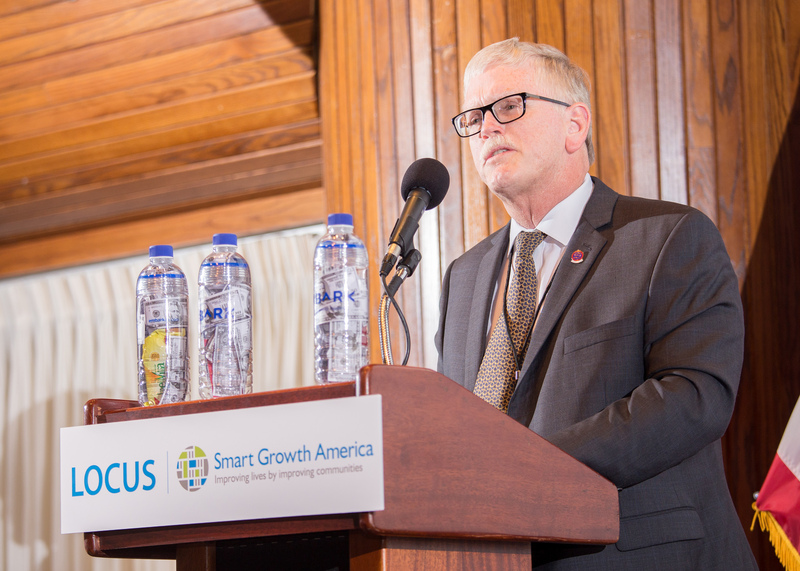 Clyde Holland, CEO and Chairman of Holland Partner Group delivered the keynote presentation on ways to solve the national housing crisis. The program then split into three tracks focusing on our three themes of Partnerships, Placemaking, and Policy. Eight real estate developers, two mayors, two federal officials, two advocacy campaigners, a lawyer, and a nationally renowned researcher led six track discussions about the new recipe for economic development, policy changes for development equity, walkable suburbs, catalytic projects, and affordable TOD. View the Summit agenda to see the full list of speakers. The final session of the day was an interactive “Shark Tank” session, LOCUS style—local elected officials and real estate developers each had seven minutes to sell their ideal projects for investment. Larry Hopper, Planning Manager for EMBARK in Oklahoma, pitches TOD development around the Oklahoma City streetcar during the final session of the Summit’s first day. And in the closing plenary, Commissioner John Schroer of the Tennessee Department of Transportation provided perspective for local leaders on working with state governments to get the most out of transportation funding. Commissioner John Scroer of the Tennessee Department of Transportation. The first day concluded with the 2017 LOCUS National Leadership Awards. This year’s Developer of the Year award went to Stanford Carr of Stanford Carr Development, LLC for his exceptional leadership in smart growth development. North American Properties was named the 2017 Company of the Year, an Atlanta-based company dedicated to projects that transform the community and create lasting value for residents. And the Richard Baron Affordable Housing Award was presented to Buwa Binitie of Dantes Partners LLC for his commitment to developing and financing “luxury affordable housing” for individuals and families. 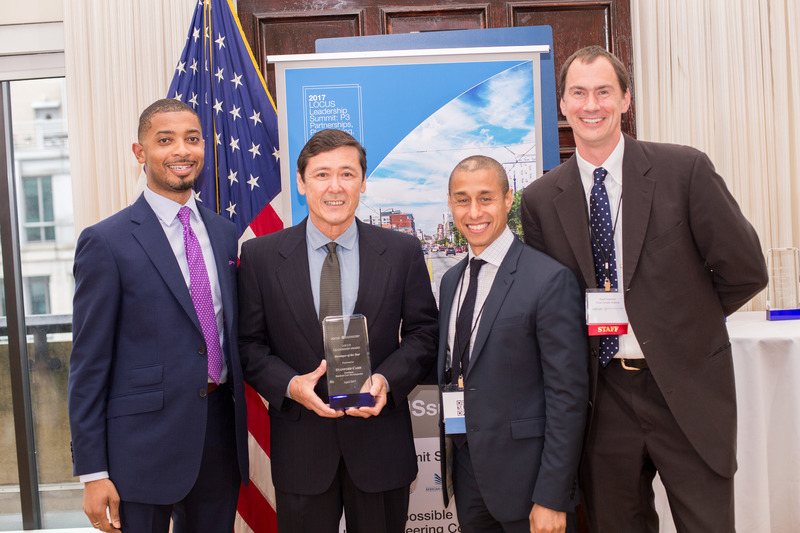 From left: Christopher Coes, Director of LOCUS; Stanford Carr of Stanford Carr Development, LLC and winner of the 2017 Developer of the Year award; Jair Lynch, President of LOCUS; and Geoff Anderson, President and CEO of Smart Growth America. On Tuesday, the Summit’s second day, attendees had the opportunity to either spend the day on Capitol Hill discussing federal policy and meeting with members of Congress, or out in the field learning about TOD neighborhood revitalization case studies in the greater DC area. On Capitol Hill, Summit attendees heard from Kara Getz, Counsel for the House Ways and Means Committee; Artie Mandel, Policy Advisor for Senator Maria Cantwell Panel; Joe Falwell, Legislative Director for Representative Peter Roskam; and Beth Osborne, Senior Policy Advisor for Smart Growth America. Together they discussed what’s happening in Congress right now regarding walkable development and transportation, and what legislative changes might happen in the next few months. Meanwhile, members of our TOD Peer Network joined a customized walking tour of development in ​Arlington’s ​Shirlington​ Village​,​ to study an example of compact, mixed-use development in an area not served by rail transit​. Visit our TODresources.org blog to read a full recap of the tour. Finally, attendees came back together in the afternoon for a field study of transit-oriented development along DC’s booming H Street NE corridor and Mount Vernon neighborhood. This recap barely encompasses the breadth of conversations and ideas that were shared during the Summit. You can view more photos of the event on Flickr. Throughout the two and a half days of events, we were fascinated to learn about projects under way across the country, and to meet people putting these ideas into action. 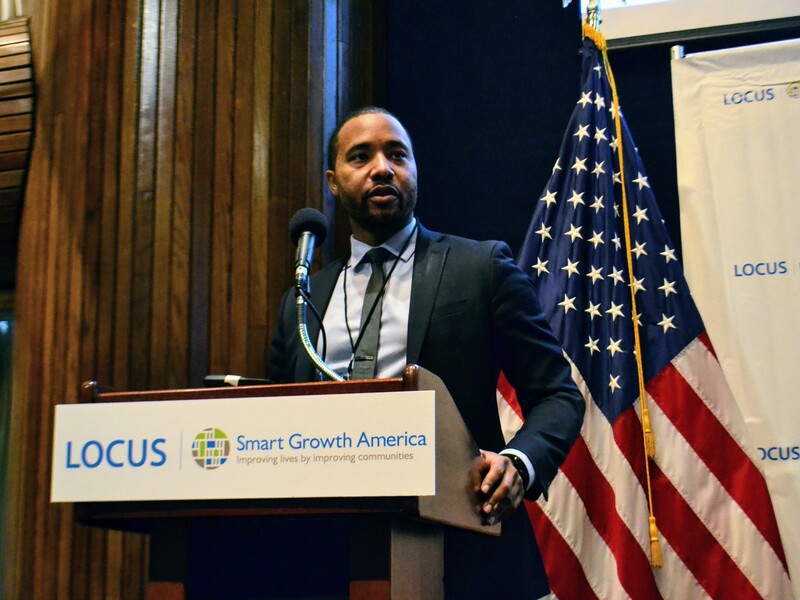 On behalf of the staff at Smart Growth America, thank you to everyone who joined us at this year’s Summit. We look forward to continuing this conversation in the months to come and seeing you again next year.